Summer lunching! 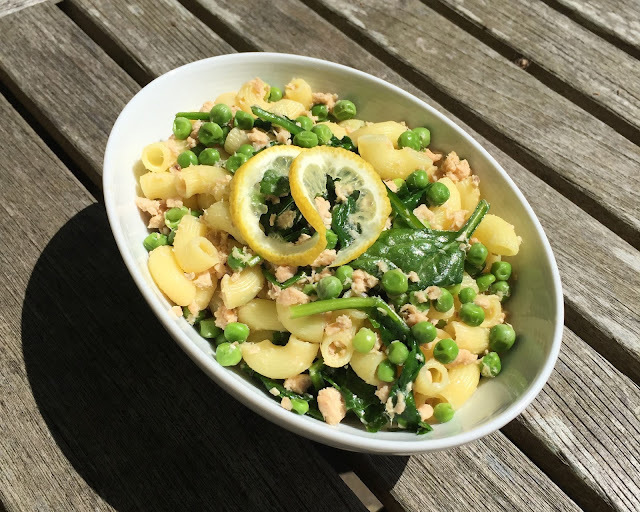 Here's a tasty and light pasta dish to share with friends whilst enjoying the summer sunshine. -Pink Salmon; you can either use tinned salmon or freshly poached/baked salmon fillet. Boil the pasta until soft and at the same time boil the peas for a few minutes. Once both are cooked, drain the water and put both back into one of the saucepans just used. Over a really low heat; add in the spinach (allowing it to wilt), add in the butter or olive oil, add in the salmon, slice a wedge of lemon and squeeze in the juice (make sure no pips fall in) and finally season with salt & pepper. Give it all a good stir, then place into a big bowl with a slice of lemon.